Howdy & Welcome to our site! We are Caleb & Krista, just living life in good ol' Montucky. We are re-establishing an old quarry that is about 3.5 acres, day by day and project by project. 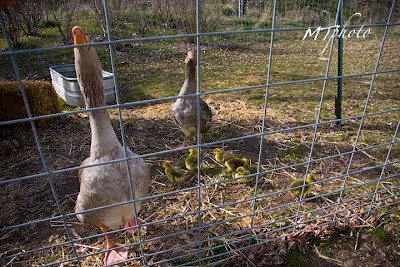 We are currently raising Chickens, Geese, Ducks, Cats, Dogs, Turtles & garden beds. Stay tuned to see what we raise next! "Paul, Caleb, and Krista review the movie “Water Harvesting” with Geoff Lawton. 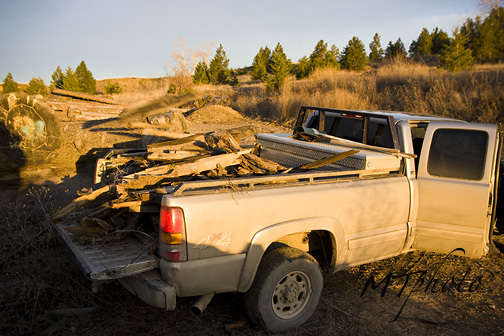 They discuss Caleb and Krista doing permaculture in a gravel pit ponds and dams–particularly how they need crowns on top. Paul likes his ponds to have water running into them all the time, which oxygenates the water. He briefly talks about swales and pond fingers. Krista asks about their clay soil–Is water harvesting enough to hydrate their landscape? 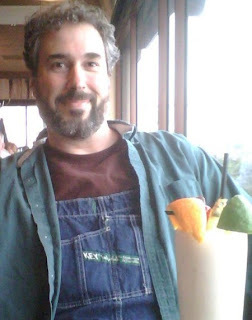 Paul says with hugelkultur there is no need, even for water harvesting. They then talk about raising pigs, natural swimming pools, and utlizing alternative energy. Paul asks Caleb about going solar, and off the grid in general, and they then discuss general consciousness about power usage. Paul likes the idea of micro-hydro power, which does not utilize dams. Caleb talks about using solar efficiently." You can also leave comments at our thread on permies.com Reclaiming Gravel Pit for Permaculture. We would love to hear what everyone thinks! We have been waiting for the goslings to appear any day now, and I woke up this morning thinking I think today's the day, I think they're here! I went outside and didn't see much. I peered in to the house from outside of the fence, and couldn't see anything inside except Mama. I guessed we could have a few more days. We didn't really count the days on the calendar from when she started laying eggs this spring, or even when she started getting broody, or sitting on the eggs. We snuck in to candle an egg about 4 days ago, and we couldn't see a thing. We went into a fairly dark area and used a very powerful flashlight, but all we could determine was that there was an air pocket filling about 1/5 of the shell, they were dirty and they stunk. Like really stinky. So we went to Caras Park to check out Paul Wheaton's Rocket Mass heater demonstration, and then I went to a baby shower (oh the irony). When I came home, I saw little green fluffy babies in the yard. I thought Caleb might have stopped and picked up some kind of animals. So I ran to get my camera and came back and realized it was the goslings! 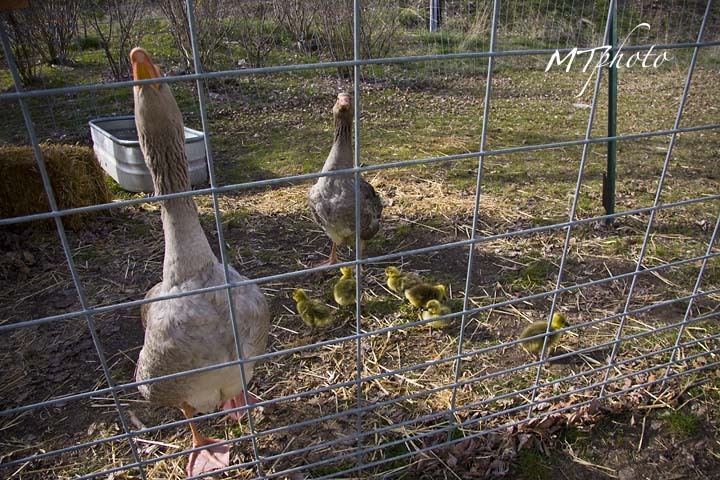 They hopped back in the fence (we have several fence structures) and were sitting with Mama and Mister. They are so cute! We had six goslings that we found today. We haven't rooted around the nest yet, we think she might have more eggs to hatch. I took some photos tonight of plants that have volunteered in the gravel pit! I have no idea what any of them are, and I'm looking for help identifing them. I took notice to these excotic looking plants while I was scrounging around the property looking for larger rocks to border the hugelkultur beds. It's exciting to see some life introducing itself in the landscape, even if they are weeds. After reading info. on permaculture I now look at weeds in a whole new light. Rather than thinking they are a terrible sign and spraying them to death, I now look at them and ask why did they germinate in this location and what clues can they give me about the soil biology and chemistry? So now that you have seen them do you have any idea what they are or what I can learn from them? Does anyone know of a good place to research plants of this type? The really interesting thing is many of them appeared next to areas were the dogs do their business. Coincidence? Any comments or answers you have would be a huge help. Thanks. In his presentation Paul talks about using mycelium in the process of cleansing oil and diesel saturated soil. Pay close attention to the pictures 8 minutes into the video, Paul shows the progress after 8 weeks of oyster mushrooms thriving in diesel saturated soil. His results are really incredible. Paul has also done research on medicinal benifits of fungi, and also using fungi as natural pesticides. It is so exciting to see natural methods of habitat restoration. While the rest of the world is screaming doom and gloom, there are people observing the ways nature repairs landscape and learning from them. This is how we will continue to succesfully inhabit the world for generations. In light of working towards getting our ducks in a row this year, we've extended our flock! 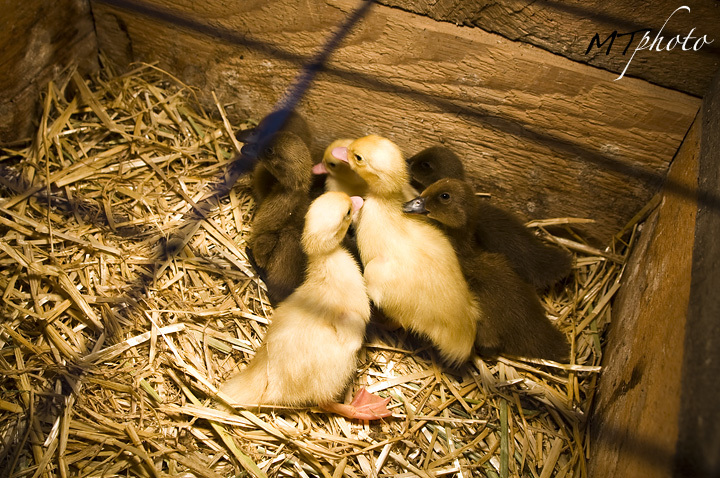 We are raising 10 Khaki Campbell and 4 Muscovy ducklings. They are so cute when they're small! 4 Khaki Campbell and 3 Muscovy ducks about 5 days old. We have discovered more and more benefits that raising fowl can provide. They forage and graze, eat lots of bugs and pests, and based on the amazing fertilizer the geese gave us last year, we are betting on ducks blessing us too. 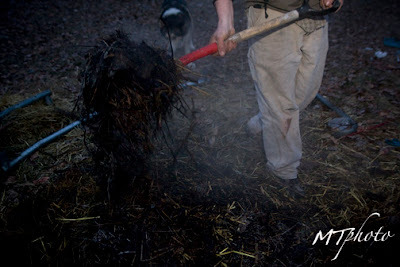 Did you know that you can make a good compost in as little as 18 days? Okay, maybe not during the winter time here in Montana, but it is possible. Our pile was rockin' at our first "turn" about 15 days ago. Just getting in to the pile. Our new mantra and exciting project: Hugelkultur! We recently discovered the idea of Hugelkultur as part of Permaculture. Hugelkultur is a process using woody material, usually at the base of a raised garden bed, to improve soil drainage, hold moisture, and use up woody materials. The wood will break down and rot over extended periods of time, which creates a great home for fungi and bacteria to live in while they break down the organic matter in the soil, and leave behind their nutrients and blessing. The wood also acts like a sponge, soaking up tons of water. This is most beneficial, because in theory, you can drastically reduce the effort and resources associated with irrigating! Cleaning up scrap wood from the log yard.